Smrikva Bowl is a tennis festival for the youngest talented players, considered one of the most particular under 10 tennis tournament in the World. Founded in 1996, the Smrikva Bowl is an annual international children’s tennis tournament and festival taking place in Smrikve. The initial decision was to organize a first-class tournament specialized for children under 10. The tournament continued to grow every year and in 2005, for the 10th annual, the Smrikva Bowl attracted top players from over 20 countries and 3 continents. For the 12th annual, the Smrikva Bowl attracted for the first time players from Africa. We had a player from South Africa and 4 continents were represented. For the 13th annual, the Smrikva Bowl had for the first time players from Australia. There were 5 continents and 24 countries represented. Right from the beginning the first prize has traditionally included a mountain bike. … since 1996 Smrikva Bowl attracted top players from 84 countries and all the continents. 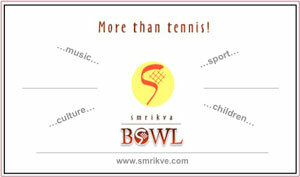 Smrikva Bowl was born with the vision of promoting values which reach beyond all frontiers, the Cosmopolitan values. Children, sport, culture and music are part of the Cosmopolitan World. Smrikva Bowl is still very young tournament but I would like to think that some of these kids will write nice and inspiring stories in most different professional fields. I also know that according to the statistics only few of the kids participating Smrikva Bowl will make it to become top professional tennis players, but I like to think that they will make it in other professional fields they choose in their lives. I was recently reading Andre Agassi’s book and through the whole book he was repeating to friends and people meeting during his life that he doesn’t like tennis thus it seems to me that he never had the option to choose, but in end he ended up being the Champion and according to Luke Jensen a person with big heart and very good friend. I will never know how many kids playing Smrikva Bowl are playing it because their parents would like them to become professional tennis players and how much of them play it because they enjoy the game. What I do know is that any kind of sport can help kids in their growth and I also know that people that do excel in any field require total dedication and a lot of sacrifice to reach the excellence. When I think of Andre’s words of not loving what he was doing for most of the time of his life I start thinking of other 90% of people around the World that make for living doing jobs they do not like, but “La vita e’ bella” Roberto Benigni would say and tennis helped Andre to grow up. “I’m not one of those people who expresses or articulates feelings very well, but from now on, just know this: It’s on, man. It is on. In every life there are people that influence what we do and how we do it. The Smrikva Bowl festival would like to inspire its players and Ambassadors to beleive in their dreams and work hard to reach them.